German Energiewende – If this is success what would failure look like? Many advocates of renewable energy point to Germany as the example of how to transform a large economy away from fossil fuels and therefore reduce carbon dioxide emissions. I have questioned the validity of that argument in posts in the past and the results from 2017 haven’t changed my opinion one bit. There are a lot of complexities in analyzing what is happening in Germany but the bottom line results are not very encouraging as far as I am concerned. Since the beginning of the Energiewende in 2003, and despite hundreds of billions of Euros in subsidies and the second highest retail electricity rates in Europe to support those subsidies Germany has managed to reduce the consumption of fossil fuels very little. Despite having deployed the third largest fleet of wind turbines in the world (behind only China and the U.S.) and despite having the third largest solar capacity in the world (behind only China and Japan) the German electricity generation sector remains, by far, the largest source of CO2 emissions in the country. In fact the modest reduction that has been realized in this sector is primarily due to a shift from coal-fired to natural gas-fired fossil fuel generation. The modest reductions in CO2 emissions realized in the electricity generation sector have been completely offset by increases in Transport and Manufacturing. 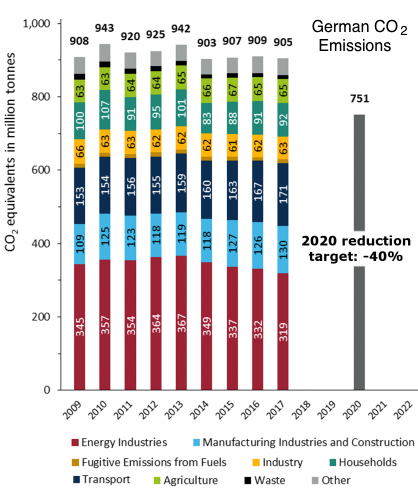 There is no possibility that Germany can meet its stated CO2 reduction targets for 2020. In fact, any further reduction in nuclear power generation will guarantee that German CO2 emissions increase. At the beginning of the Energiewende Germany was neither a net exporter or importer of electricity. At times of higher demand in Germany electricity was imported from neighbouring countries and at times of lower demand in Germany electricity was exported. This is a normal characteristic of a healthy regional grid where resources can be shared as needed. Gross German imports and exports were about 40 TWh each. As more and more wind and solar was developed in Germany the sad reality of non-dispatchable resources started to become evident. Solar and wind energy was forced onto the regional grid at random times when those resources were available without regard for whether or not there was any demand. Even ramping dispatchable generation up and down in order to try and match renewables was not enough (and, in fact, caused enough damage to one of Germany’s largest nuclear plants to force it to shut down). Only one option was left – export the excess electricity to Germany’s neighbours whether they needed/wanted it or not. Over the years this trend has gotten worse and worse to the point where, in the last two years, virtually all additional wind and solar capacity additions have translated directly into increased exports. 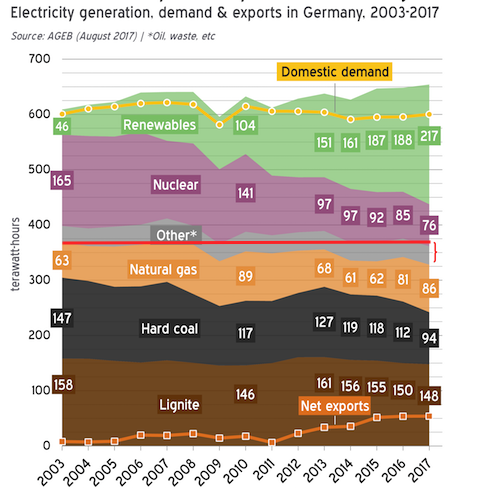 Adding more solar and wind generation is no longer displacing any fossil fuel or nuclear generation in Germany itself. It may make for nice green-washed headlines (“Renewable power hits record high in Germany in 2017!”) but it won’t help Germany reduce its dependence on fossil fuels in any significant way. And in the meantime the impact of Germany’s “success” has created what Dr John Constable has described as a “curiously distorted market” in the Euro zone. When the Energiewende began Germany had electrical generating capacity of about 100 GW from “conventional” generation sources including small amounts of hydro and biomass and, in addition, about 15 GW of Wind. By 2017 “conventional” generation capacity was still at about 100 GW but the nameplate capacity of wind and solar in Germany had grown to match that value. In other words, with electrical demand remaining flat since the beginning of the Energiewende there is now theoretically more than double the capacity needed to generate electricity in Germany. And yet Germany still imported 30 TWh of electricity in 2017, down only 25% from when the Energiewende began. Once again, the non-dispatchable nature of wind and solar provides the answer. On cold, calm winter nights no wind or solar energy is available (it should be noted that the high pressure systems that produce really cold weather are characterized by calm winds which I used as the basis for my post “The Fright before Christmas“). The German approach has done more to identify what doesn’t work than it has illuminated the path to a future powered by sustainable energy. Germany has essentially exhausted the capacity of the entire European grid to absorb uncontrollable wind and solar generation. That means that no other large country in Europe can do what Germany has done. Even within Germany itself the problems are now recognized and major reforms are under way – reforms that will inevitably slow the further development of wind and solar energy sources. Massively scalable and incredibly cheap energy storage systems are required to deal with the intermittent and variable nature of wind generation, which has to be the primary source of energy in the mid and northern latitudes. Why only wind? Because at those latitudes peak electricity demand is in the winter when very little solar energy is available. And that peak demand will only grow more extreme as we go through the necessary transition to stop burning natural gas to heat our buildings. I believe that the kind of energy storage systems that we need can be developed but they will require a lot more funding and support than they get today. There are other initiatives that can help as outlined in my Sustainable Energy Manifesto.